Vegetables can be grown in just about any container you can imagine, as long as the plants have enough soil and the container has holes for drainage. Don't let the gardening catalogs fool you-- you don't need to spend a lot of money on pricey containers to grow vegetables. 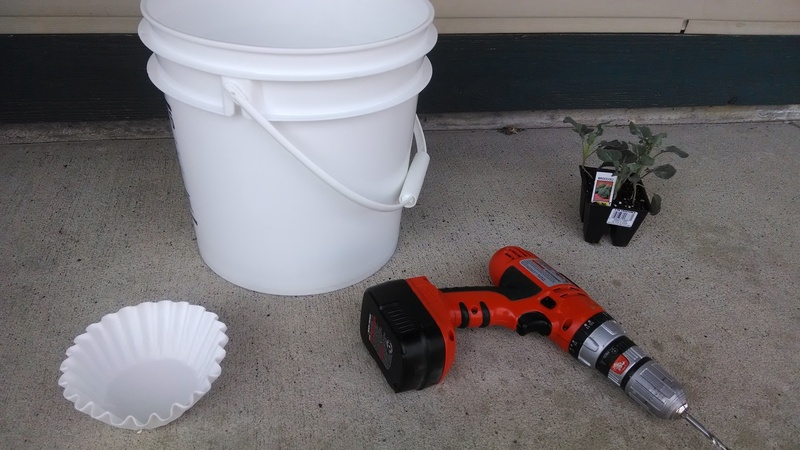 One of the simplest methods is to use a simple plastic bucket as a planting container. The size of bucket to use depends on what you intend to grow. Tomato plants and vining crops such as cucumbers and squash will do best in at least a 5 gallon bucket. Smaller plants such as peppers, broccoli, cabbage, and shorter vines like peas can do well in as little as a gallon of soil, but somewhere in the 2 to 4 gallon range will be much easier to manage when it comes to keeping the plants watered. Some early spring crops besides broccoli that would do well in a 2 to 4 gallon bucket garden include: cabbage and cauliflower (one plant per bucket), onions (use onion sets (bulbs) spaced 1 inch apart for green onions, 3 to 4 inches apart for dry onions), carrots and beets (sprinkle seed across soil, thin seedlings to 2 inches apart when they are 2 to 3 inches tall), peas (plant seeds 1 inch apart in a circle near outer edge of soil in bucket; train vines to a trellis or stake) and lettuce (sprinkle seed across soil, cut leaves as needed, allowing plant to regrow). Buckets can of course be purchased, but many businesses use supplies that come in buckets that can be re-purposed as a bucket garden rather than sending them to the recycler or the landfill. But not all buckets are created equal. Buckets that formerly contained food items are generally considered safe for growing vegetables in. At the Extension office, a few phone calls to a local sandwich shop and bakery yielded enough buckets to get started this spring. We are using a 4.25 gallon bucket from our local grocery store bakery. The buckets previously held 4.25 gallons of butter cream icing. 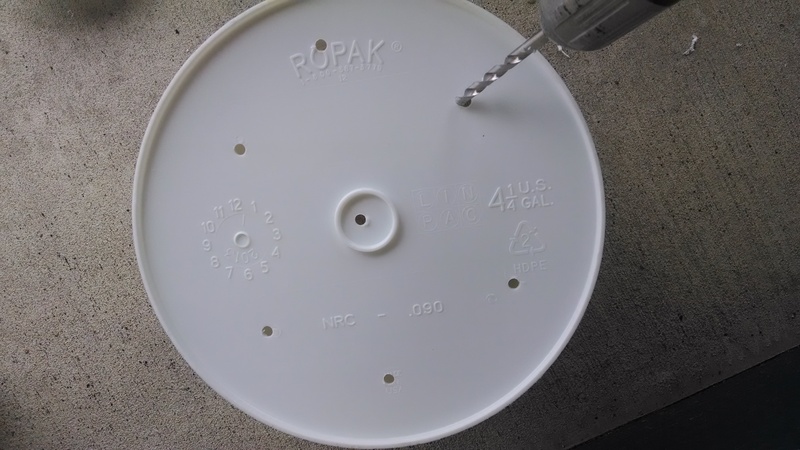 First, using a 1/4" drill bit, drill 7 evenly spaced holes in the bottom of each bucket. 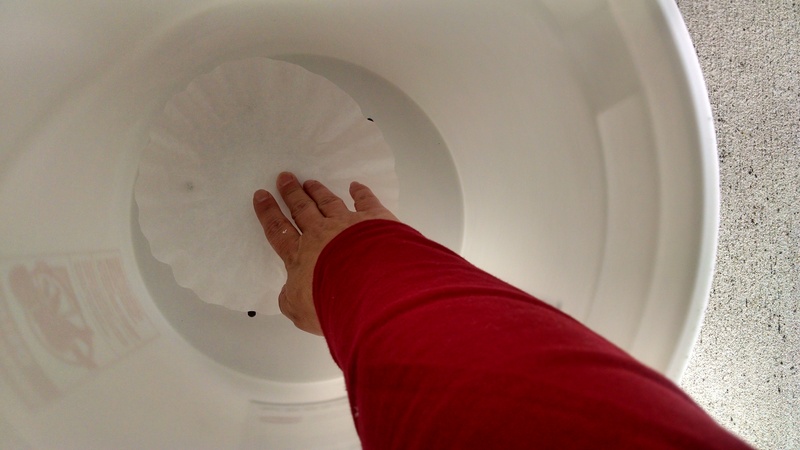 Cover the holes to keep the soilless mix from washing away by placing coffee filters over the holes in the bottom of each bucket. About 3 filters will fill the bottom of the bucket, and they will overlap. 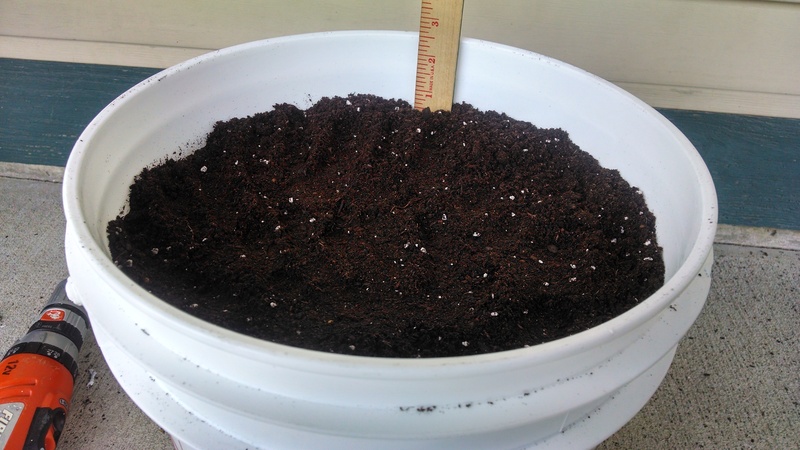 Fill the bucket to within 2-3 inches from the top with a good quality soilless potting mix. Do not use soil from your yard or garden. It will not drain properly and there is a good chance you will bring in pest, weed, or disease problems using native garden soil. Soilless mix is specially formulated to hold the right amount of moisture for plants in containers, and is sanitized to eliminate pest, weed, and disease problems. If the soilless mix you are using does not already contain fertilizer, it is good practice to use fertilizer at planting time. A general purpose (10-10-10 or 12-12-12) fertilizer is a good choice for most vegetables. These can be applied in granular, time-release, or water soluble forms according to label directions. Some soilless mixes contain moisture control crystals which absorb water and slowly release it to the plants. These crystals are not a necessity, but many people find that their containers dry out a little slower, making watering a little easier. If your mix does not contain the moisture control crystals, they can be purchased separately at many garden centers and added to the soilless mix according to label directions. The easiest way to plant broccoli is to use transplants commonly available at garden centers in the early spring. 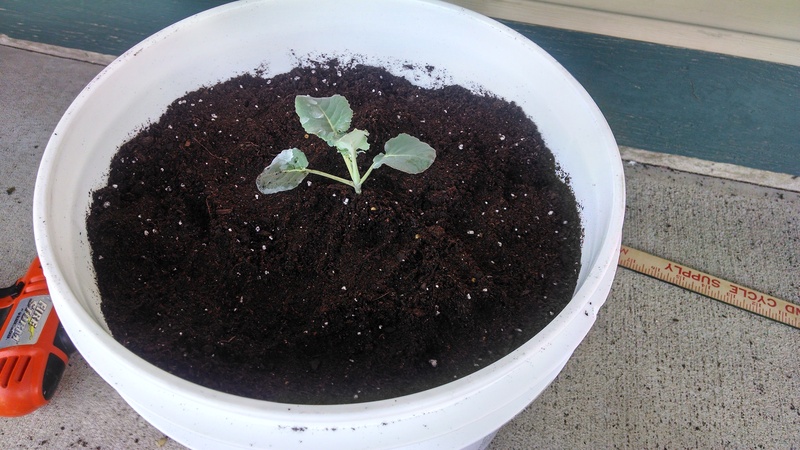 We were able to purchase 4 broccoli transplants for under $2. Gently loosen the roots of each transplant before planting one plant in the center of each bucket. 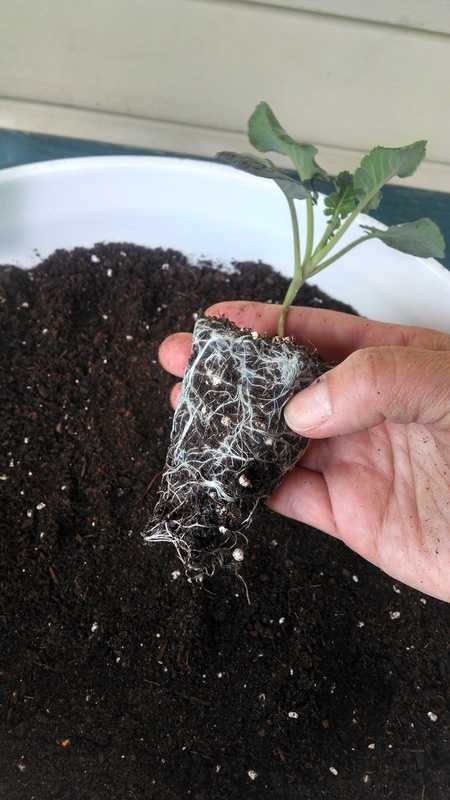 The top of the root ball should be right at or just barely under the soil in the bucket. Water the newly planted bucket garden well, saturating the soilless mix. You should see water draining from the holes in the bottom of the bucket. Keep the soil moist but not soggy. Broccoli can tolerate frost and light freezes, but if temperatures dip into the mid to low 20's (degrees Fahrenheit), move your bucket garden temporarily indoors. As the broccoli plant develops, the broccoli head that we eat will begin to form in the center of the plant. This is actually a tight cluster of flower buds. This weekend is a great time to get your own broccoli plants out, whether in a bucket, a pot or if the soil is not too muddy, your garden. Check back on this blog and we will keep you posted on how our buckets of broccoli are progressing. "Grow along" with us this year!